Repkong straddles the Repkong River, mushrooming upward with the infusion of government capital in the form of high rise apartments, government buildings and hotels dedicated to future residents. It looks like a city of at least 200,000, though actual residents may only number 100,000. Still, that’s number could not have been foreseen 10 years ago when the city was only 10,000-and almost all Tibetans. All the major roads downtown are under renovation, causing widepsread inconvenience. 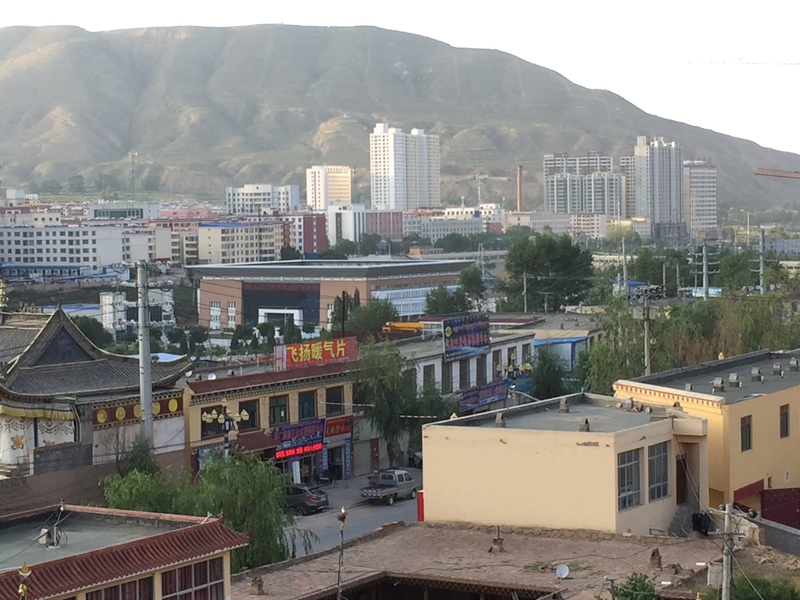 Here’s the rub of reality for Tibetans: development is happening so fast and on such a scale that they have no time to adapt. 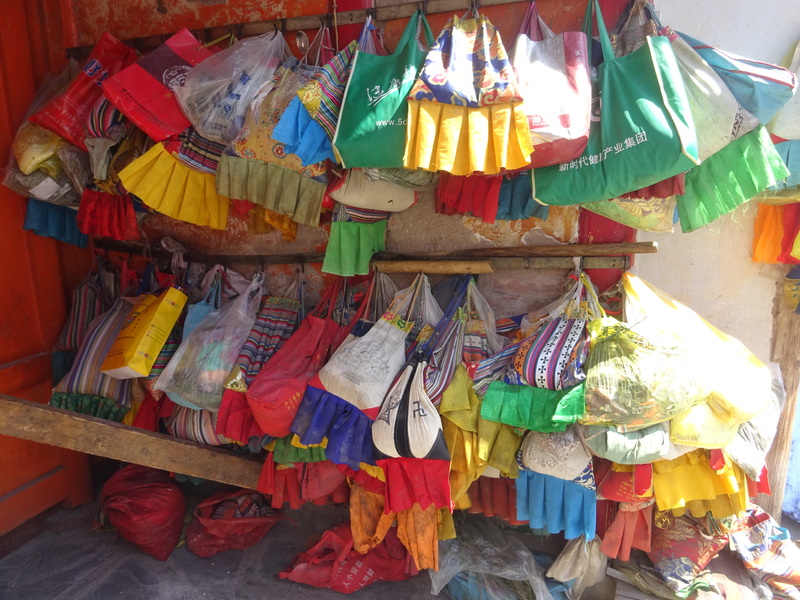 The government has erected barriers to full economic participation, yet insists on Tibetan assimilation. 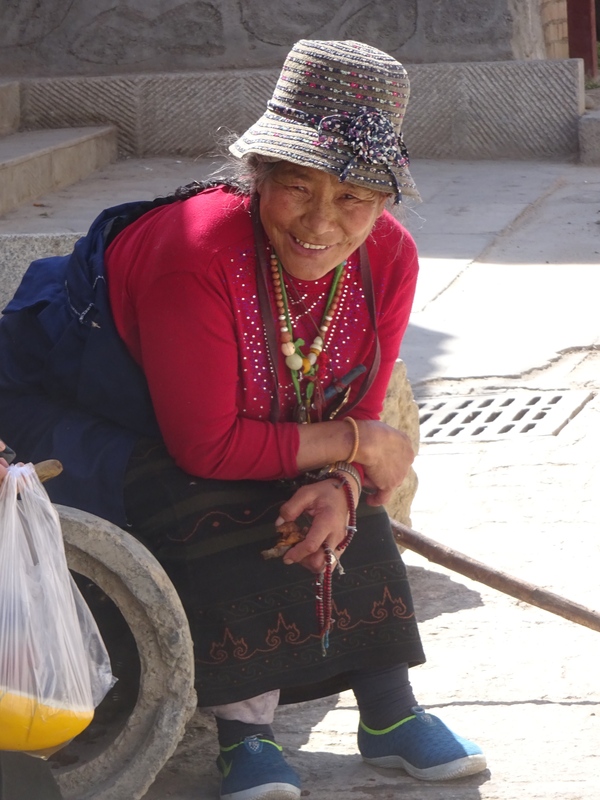 The Chinese population of Tibet long ago exceeded the six million Tibetans that remain. The future foretells much more of the same. 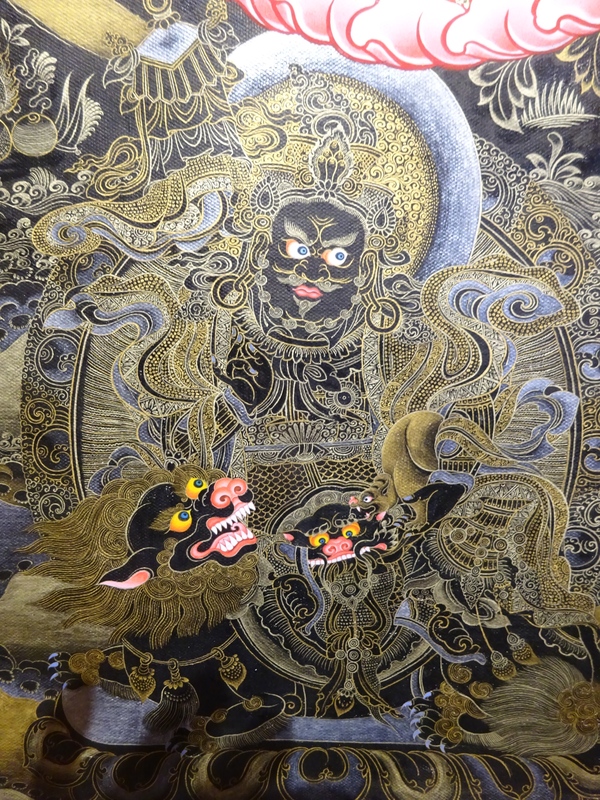 My first actual stop in Repkong was an art gallery, Rigjong Ling, devoted in part to a reknowned and highly honored tangka artist Shawo Cho, displaying some of his work as well as a fabulous collection of aged thangkas, statuary and masks. Repkong is known as a colony of highly skilled artists. I was not disappointed. 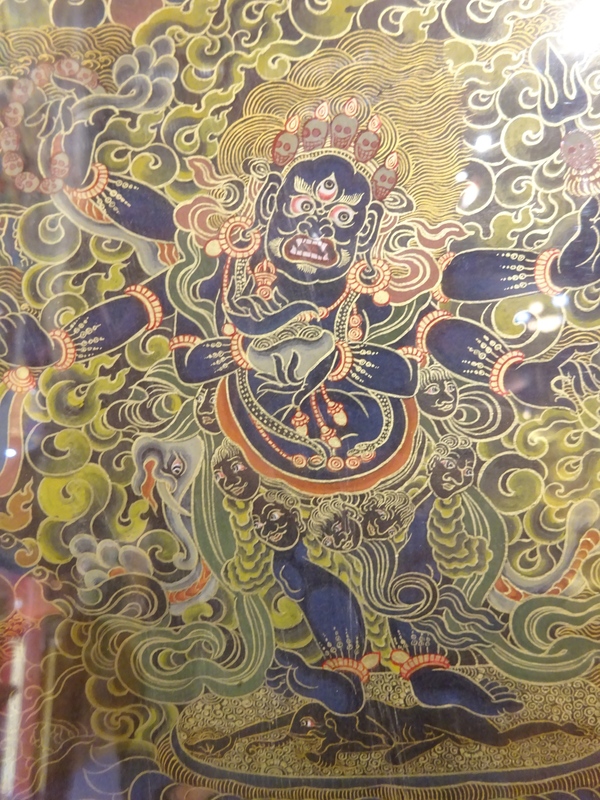 These next few photos are of sub-parts of one of Shawo Cho’s works, a $500,000 tangka. Each of these shots are worthy of being central subjects in their own right, are most often depicted that way and would command high prices on their own. But here, they are mere sideshows to the main subject. Elsewhere in the gallery was this 400 y.o. 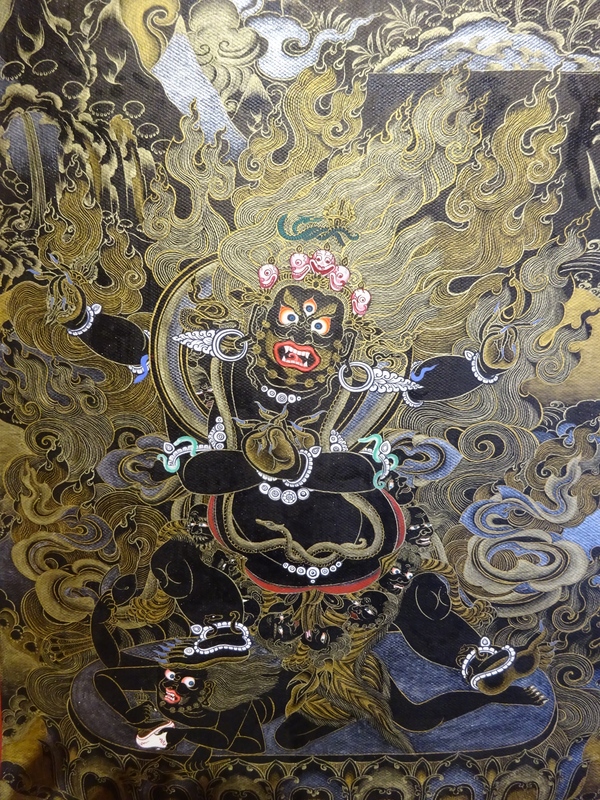 rendition of Yama. …and for a change of pace, a peaceful version of Dorje Palmo. 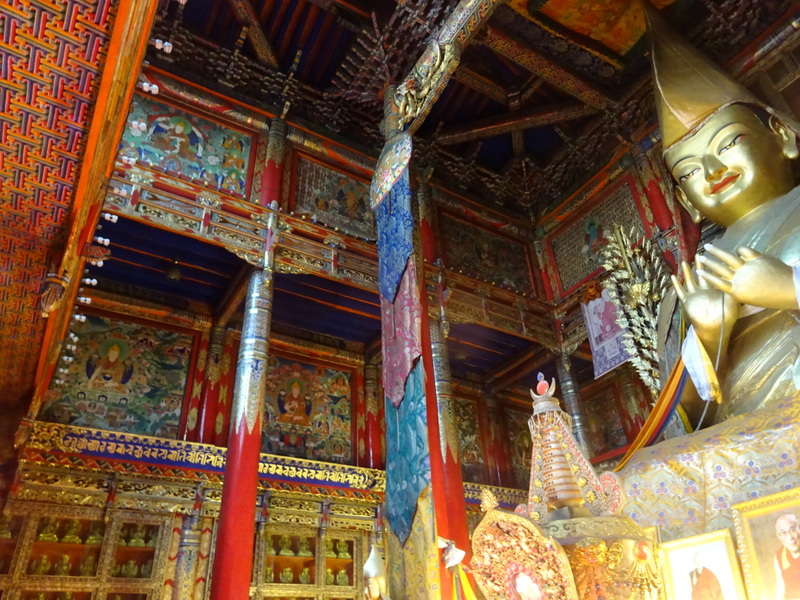 On to Sengshong Gaden Phuntsok Choeling, a colorful 350 year old monastery in Repkong. 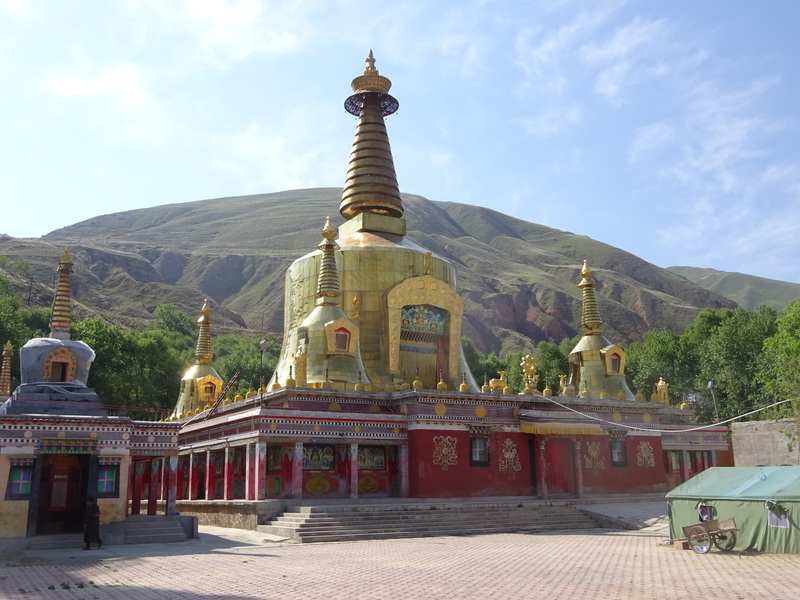 On entry, one is immediately met by two large chortens, one for Kalachakra, one for Atisha containing relics of the founder of the monastery. 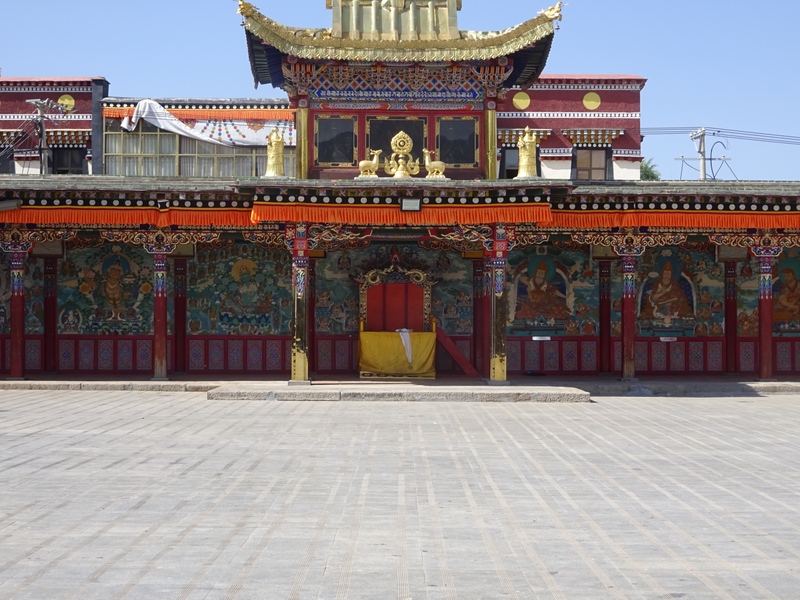 Sengsong Gaden was spared damage during the Cultural Revolution because it was turned into a grainery, something also done elsewhere in Tibet if there was time before the Red Guards appeared. Outside and inside the main temple, grain was stacked up about 5 ft from the floor, covering small murals at ground level. Above 5 feet, the large wall paintings on both the outer and inner walls, perhaps six feet square, were turned backwards to face each other and pro-Communist slogans were painted on the blank backsides. This turned out to be a pretty reliable way for smaller monasteries to escape the wrath of the proletariat. 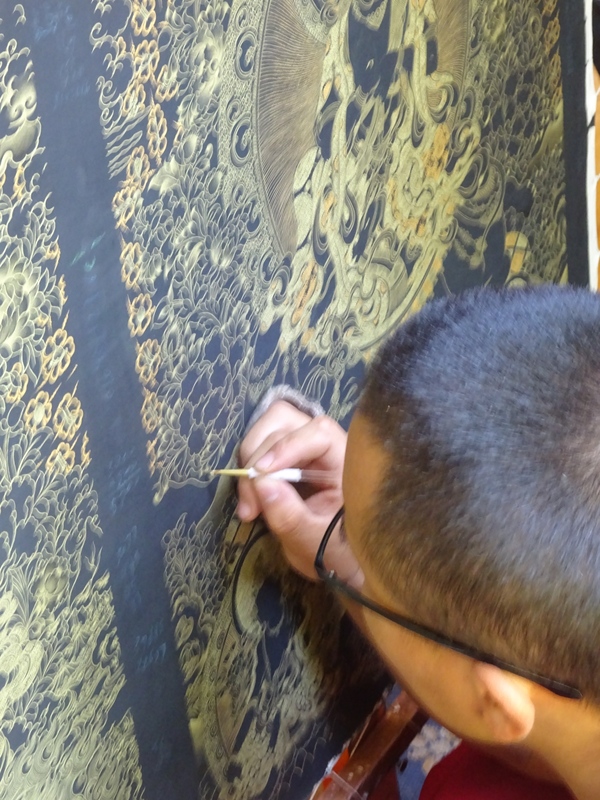 I discovered that the monk manning the ticket booth is also a painter. His work adorned the walls and was stacked on the floor. One piece of extremely fine work in particular caught my eye. Talent and dedication can be found in the most unexpected places. We walked around the corner from the monastery into another school where the teacher and two students were painting. First I asked how many hours per day these students worked. Twelve hours. I asked how long it takes to become an accomplished artist. Four years of daily practice to achieve a level of competency required to turn out high quality work. 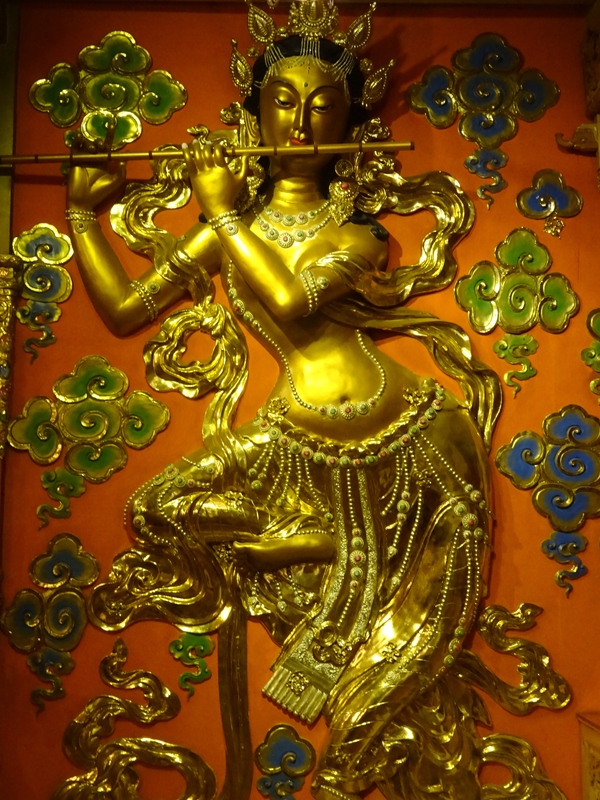 And with that competency comes complete fluency with all the deities of Buddhist cosmology, all the protectors of precious qualities, the Dharmapala (guardians of the dharma) all the bodhisattvas, teachers and all the Buddhas. Such is the nature of the lineage stretching down the centuries that produces images of these characters filled with the most precisely detailed symbolism and attitude. 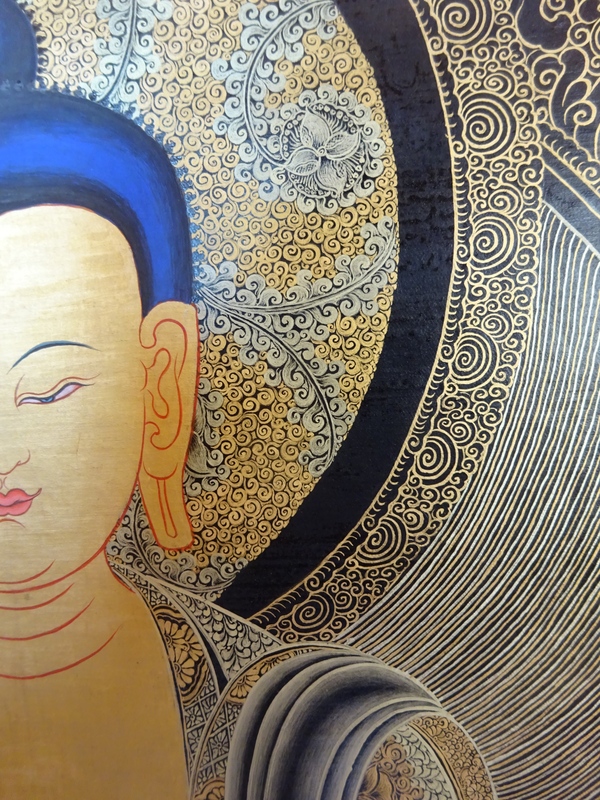 Any proficient student must master all the lesser subjects before even being permitted to paint the Buddhas. 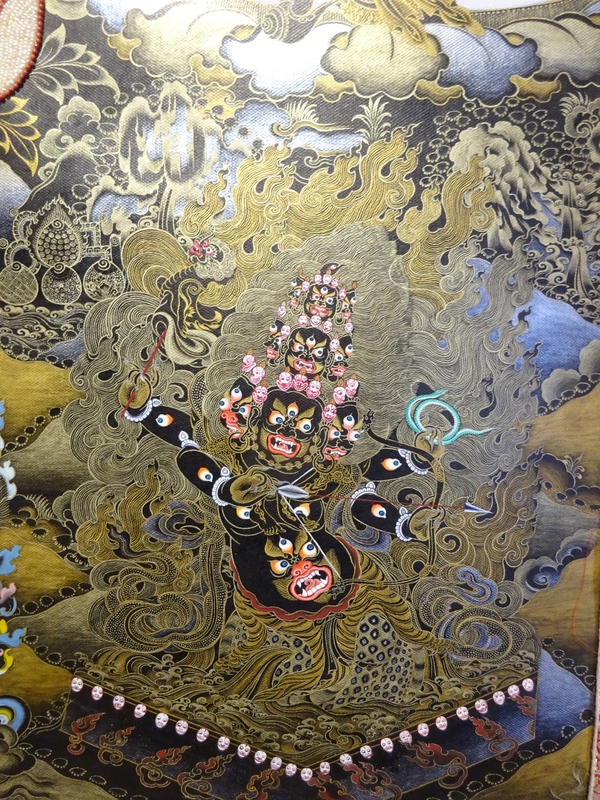 I visited two painting schools—both exhibiting quality beyond what I have seen in Nepal. I tried to buy one for $1200 and another for $1600 but there was no way to use a credit card. No bank except Bank of China will certify a credit card transaction and no bank will change currency except Bank of China. No Bank of China branch in Repkong. 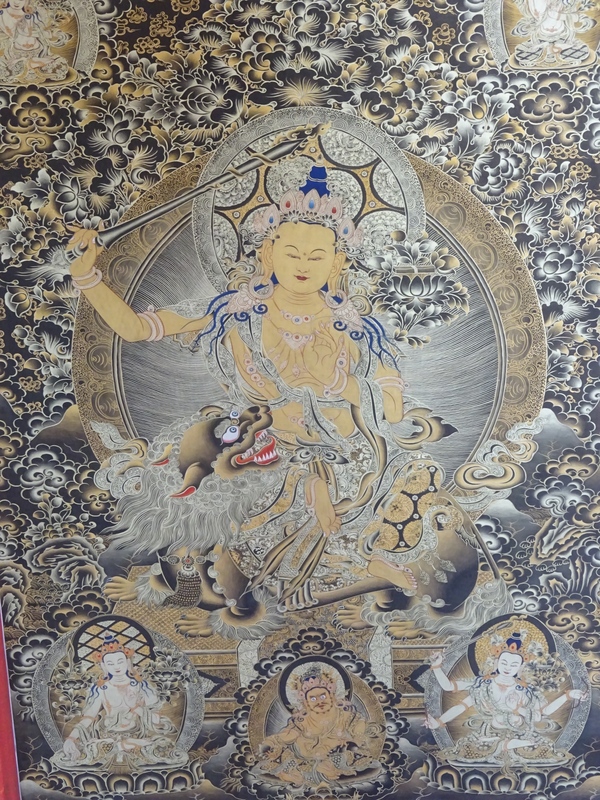 Manjushri. The one that got away. Note: If you are looking for a high quality tangka, bring cash. 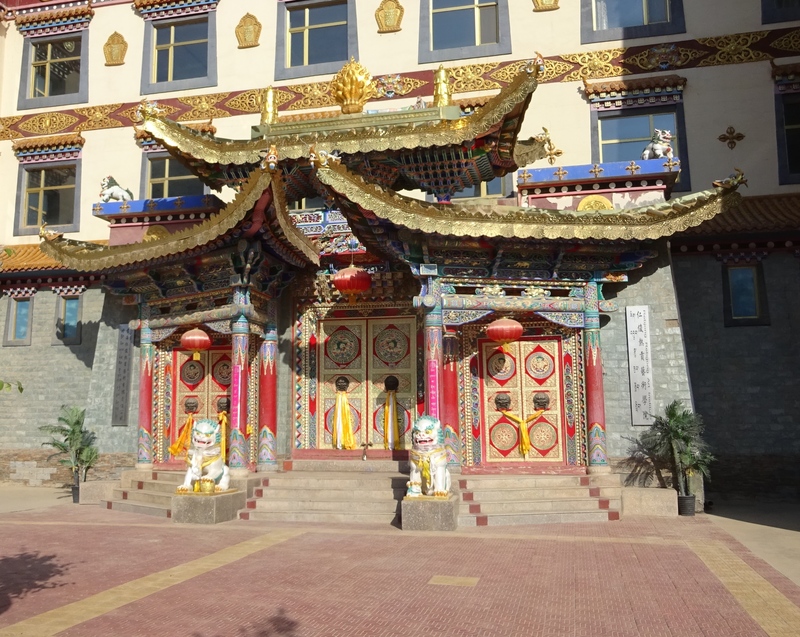 We took a break in the middle of the day, had lunch and rested for couple of hours before going to Rongwu, the largest monastery in Repkong. We intended to time our visit with a debating session at 5pm. Unfortunately, it rained. No debate. 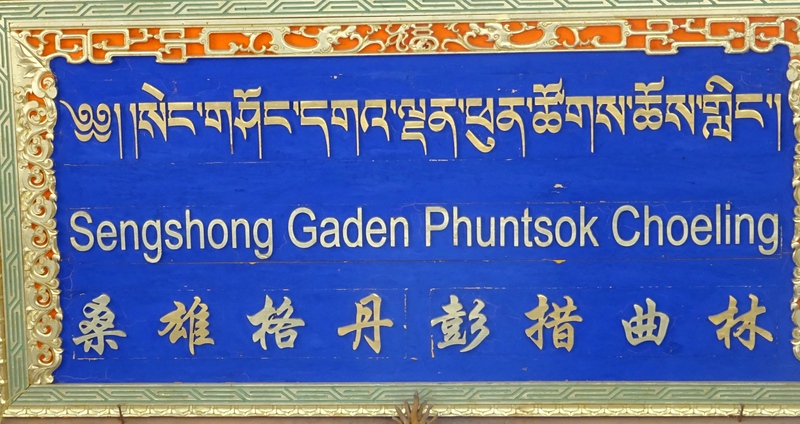 In each of the monasteries in Repkong, just as in Trika, there is a temple for Tsongkapa in which he is flanked by the first Dalai Lama and the first Panchen Lama, his principle disciples and the highest and second highest figures in the Gelug sect, respectively. Rongwu Monastery (founded 1341) is large, like a village really, a maze of cobblestone pathways linking the monk quarters behind high stone walls. 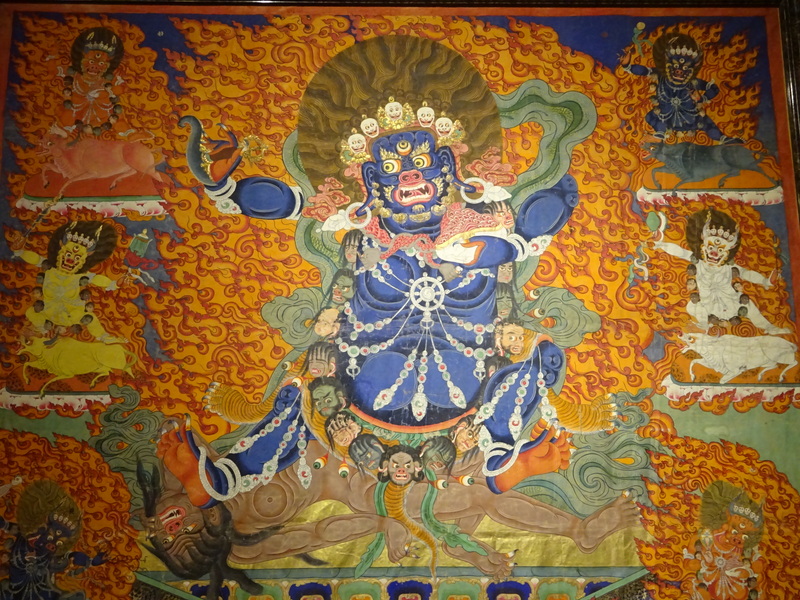 There are multiple temples, to Haryagriva, Tsongkapa, Manjushri, Kalachakra, Amitabha, Tara, and Palden Lamo (in which resides a full set of robes belonging to the 14th Dalai Lama, right next to the donated bottles of vodka—apparently Palden Lamo likes to drink). 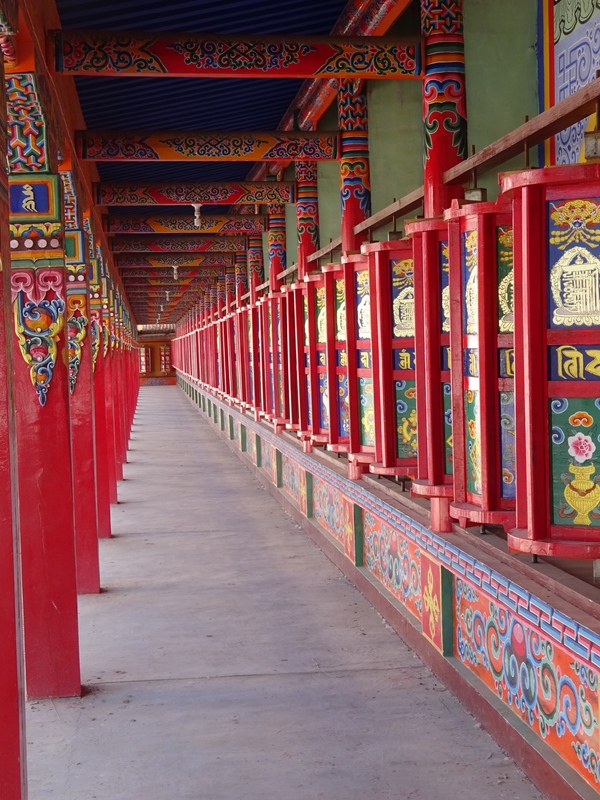 Rongwu also has two dozen satellite monasteries in the Repkong area. They are not alone in this respect. 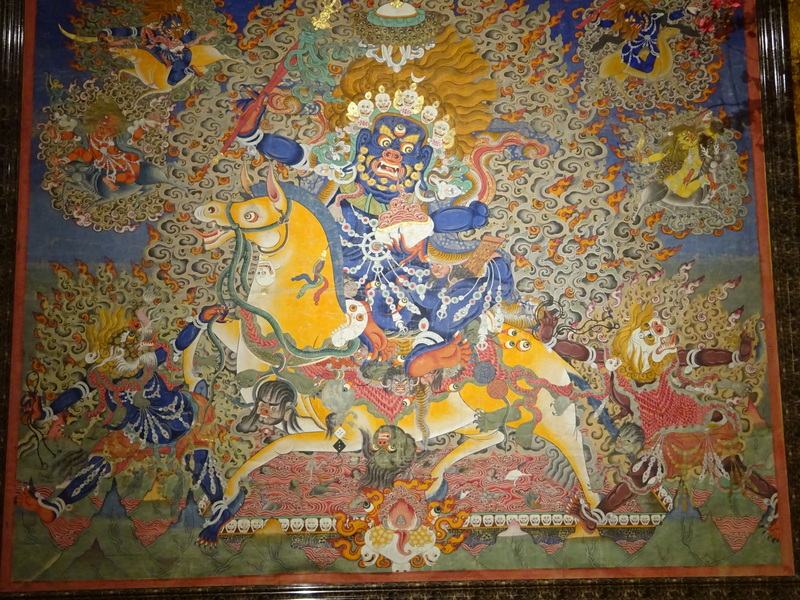 Kumbum and Labrang are the same. There are 700 monks at Rongwu, a mere 10% of what the community that once lived here before the 1960s. 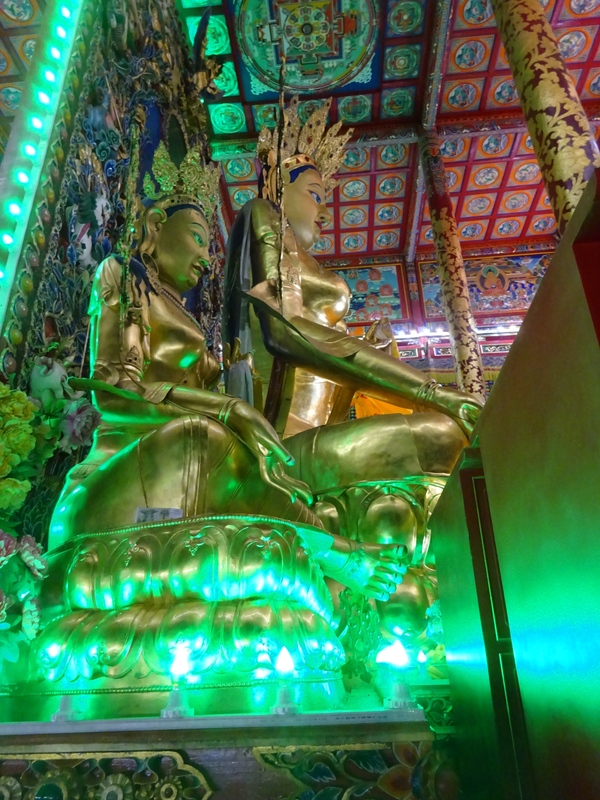 The number of monks at any of the large monasteries in Tibet are uniformly restricted to about 10% of what they once housed before the Cultural Revolution. 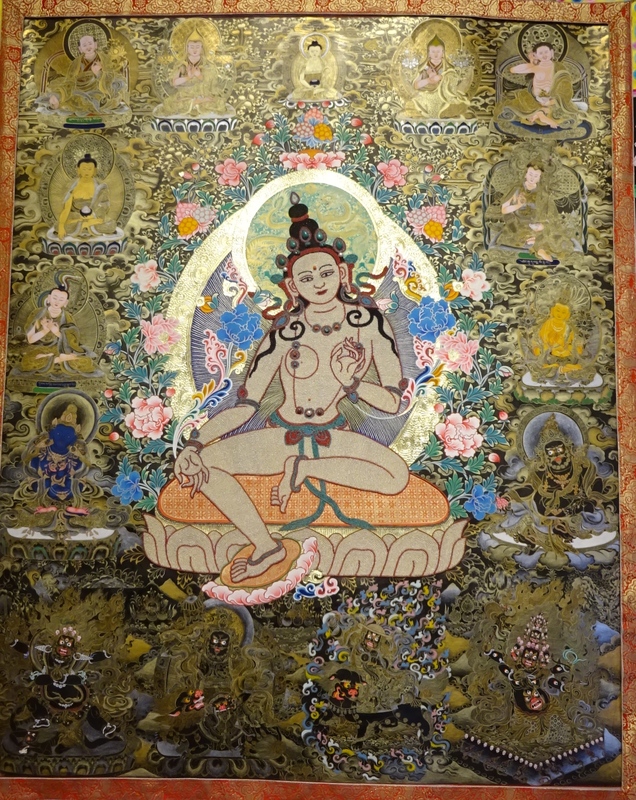 This entry was posted in Buddhism, Personal, Tibet, Travel and tagged Manjushri tangka, Repkong, Repkong tangka artists, Rigjong Ling, Rongwu Monastery, Sengshong Gaden Monastery, Shawo Cho, tangka art, tangka painter training by garyhorvitz. Bookmark the permalink. 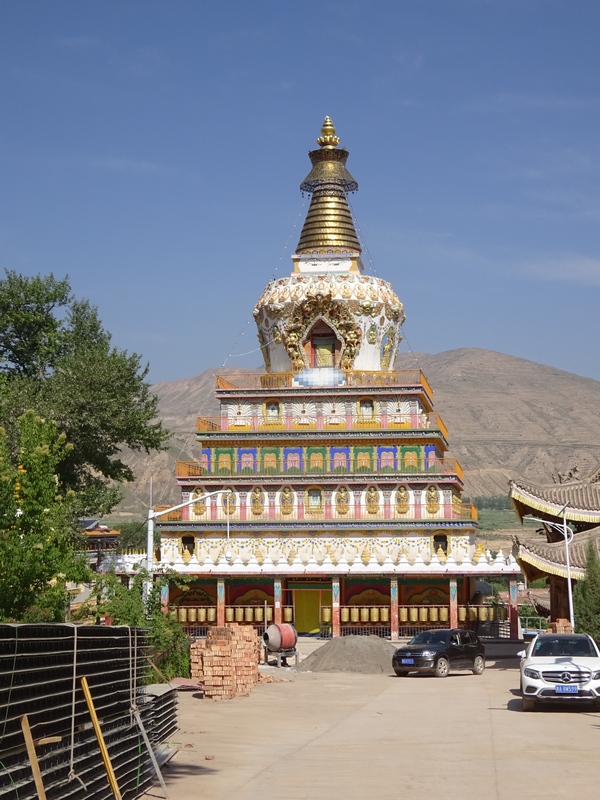 Hi Tree, I traveled with a guide and driver everywhere, though this is not required in eastern Tibet (Amdo and Kham). 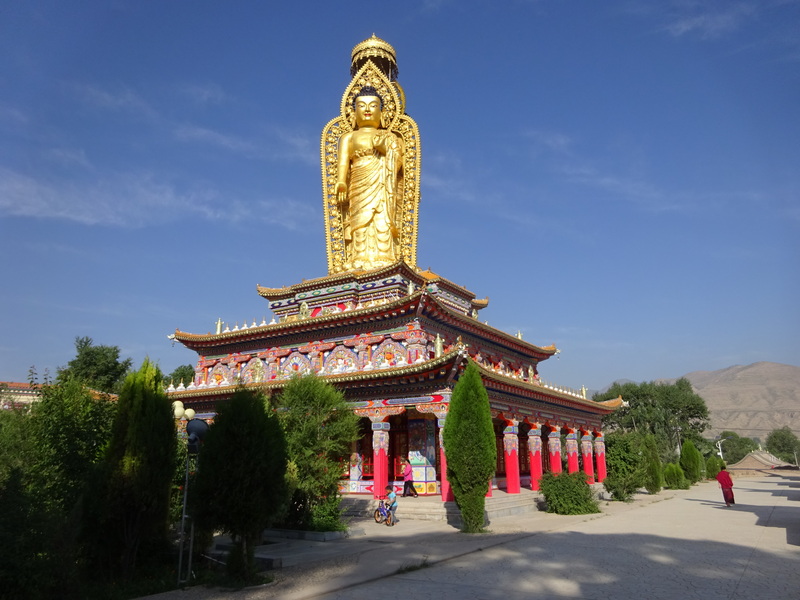 Absolutely required in central Tibet (Tibetan Autonomous Region)–plus pre-approved travel permit with itninerary. btw, the road into TAR from Kathmandu has yet to be repaired–or should I say, the Chinese part of the road has been repaired. The Nepali part has not.